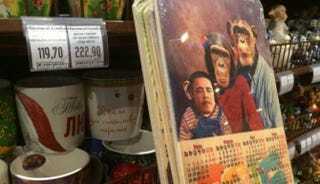 The Bakhetle supermarket in Moscow issued an apology Thursday saying it was unaware that President Barack Obama's image was superimposed over a monkey's face on a cutting board, according to Agence France-Presse. The apology came after protests from the U.S. Embassy over the offensive cutting board that had an image of a family of monkeys, with the smallest of them bearing a superimposed photo of the president. Officials with the store said on Thursday that the items had been pulled from its shelves, noting that it was unaware of Obama's image, the report says. "Sales of the chopping boards have been stopped," said Valentina Moiseyeva, a spokeswoman for the Bakhetle supermarket chain, AFP reports. Controversy erupted after a customer bought the cutting board in a store and took pictures that went viral on social media.